Foxconn, Apple's Taiwan-based manufacturing partner, is said to be planning to establish manufacturing plants in America, and is evaluating sites in Los Angeles, Calif., and Detroit, Mich. The rumored manufacturing plants are expected to focus on building LCD television sets, according to a report published Thursday by hit-or-miss industry publication DigiTimes. Citing "market watchers," the report suggested that the plants will not be used to manufacture Apple products, because the work is "rather complicated. The rumored expansion of Foxconn to America comes as the company's chairman, Terry Gou, also reportedly said at a public event that his company is planning a training program for U.S.-based engineers. Through a planned partnership with the Massachusetts Institute of Technology, Foxconn hopes to bring American engineers to Taiwan or China to be involved in product design and manufacturing. Based in Taiwan, Foxconn has a number of manufacturing plants in China where it assembles devices for a number of large electronics companies, including Apple. But Apple has come under fire from critics who disapprove of Foxconn's use of cheap foreign labor. 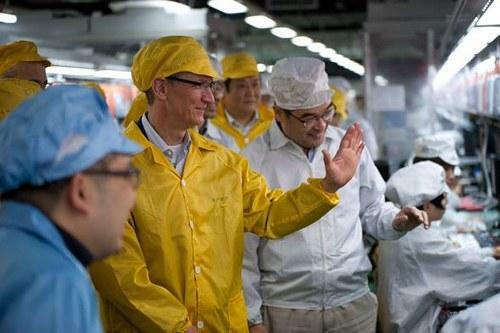 Apple Chief Executive Tim Cook visited a Foxconn plant in Zhengzhou, China, earlier this year. Apple Chief Executive Tim Cook was asked earlier this year about the possibility of manufacturing his company's products in America. He said he would like for Apple products to be made stateside, but he also noted that critics have placed an "intense focus" on final assembly, while there is a great deal more to creating devices than just that one step. A report from AppleInsider in July noted that some of Apple's key component suppliers have begun increasing their U.S.-based production. But because those companies frequently assemble components around the world, it's unknown just how much of a device like the iPhone is truly made in America. Foxconn has begun expanding outside of China and the Far East in recent years, most notably with a new plant in Brazil that manufactures iPads for Apple.